Another QCon has come to San Francisco and gone. It was a whirlwind of informative talks from enterprise software industry leaders such as the creator of Clojure Rich Hickey, Kiran Prasad of LinkedIn Mobile, Bob Lee- creator of Google Guice and the Chief Technology Officer from Square. Rich discussed Design, Composition and Performance and Communicating Sequential Processes using channels in Clojure and Zach Holman from Github provided some insights into why that site's a success. The 3-day conference at the inviting environs of the Hyatt boasted a jam-packed schedule of speakers, exhibits and activities that made for some difficult decisions as to which tracks and what happening to attend. Coding techniques, Online Controlled Experiments and Applied Machine Learning were just a few of the fact-filled talks and presentations that attendees were offered in room after well-attended room. There was enterprise software focused learning opportunities found; in the Grand Ballroom, which was portioned A-D in order to accommodate the many speakers and also above on the second floor rooms of differing sizes with names like the Golden Gate Room and Marina Room. The meeting spaces were laid out with chairs for the audiences and podiums with presentation screens for the speakers. On each of the three days of the QConSF conference when the sessions ended the attendees poured out of the rooms to find refreshments and enterprise software solution providers like API management company 3scale, Compuware APM, Oracle, Hansoft, AppDynamics, AZUL Systems, HUGE, Layer7 Technologies, Salesforce, SemanticMerge, O'Reilly, cloudera and Solace Systems. The view from the QConSF conference's expansive exhibit floor included an IBM booth, where Big Blue Technical Evangelist Tom Banks talked about the benefits of gamifying the enterprise software development experience. Tom's talk featured a Raspberry Pi/radio-controlled car that demonstrated several capabilities of the IBM WebSphere Application Server Liberty Profile. Developer Evangelist Jon Gottfried at the booth of telephony provider twilio was there to explain how devs could build scalable communications into their apps in the cloud. Look for Jon to appear in an upcoming InfoQ video interview captured at QConSF. The partying and brainstorming sessions made it difficult for some to make it to the beginning of the following day's scheduled talks. But the networking opportunities at QConSF happen only once a year. Those trying to maximize them were aided by a free shuttle service to and from the exclusive social venue. The often-capricious San Francisco weather did its part. Clear and warm days and nights made for splendid commutes for those attendee's not actually staying at the Hyatt. Attentively catered lunch and dinner buffets assured QCon patrons of well-needed fortification to help absorb the myriad of facts, figures and software coding know-how. The way time flies it will soon be time for QCon London where the focus will be on; process, architecture, the front and the backend. 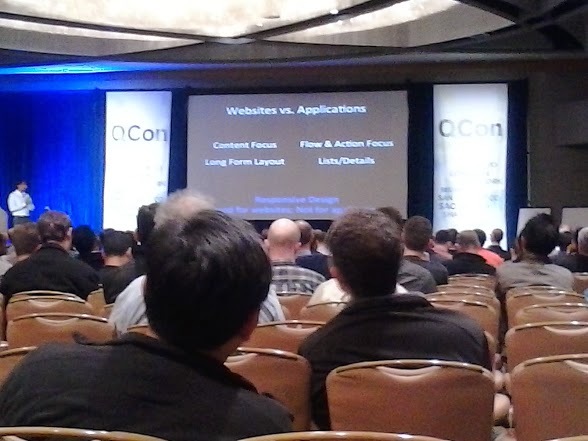 Each QCon provides its own singular body of lessons to draw from.